Architecture is the art we live in. Buildings shape the rooms, gardens, streets, and cities where, for better or worse, we human beings spend most of our lives. A new exhibit at the deCordova Sculpture Park and Museum in Lincoln takes a fresh look at architecture from the viewpoint of its many connections with the rest of human life. “Lived Space: Humans and Architecture” is a modest exhibition, but well worth a visit. Curatorial assistant Scout Hutchinson has rifled the museum’s permanent collection and assembled 26 works of art to illustrate her theme. They come in many sizes, shapes, and styles and date from the 1920s to the recent past. Some of the artists are famous, others less well known. Most of the artworks suggest more than one possible meaning. Other artists invent magical interiors. From the great photographer Walker Evans comes the image of a tiny bedroom in Truro. In dim, spooky light we see what appear to be three stored memories of a departed life: an empty bed, a wood stove, and on the wall a single ancestor photograph. A tight wrapping of patterned wallpaper seems to seal the space off from the world outside. 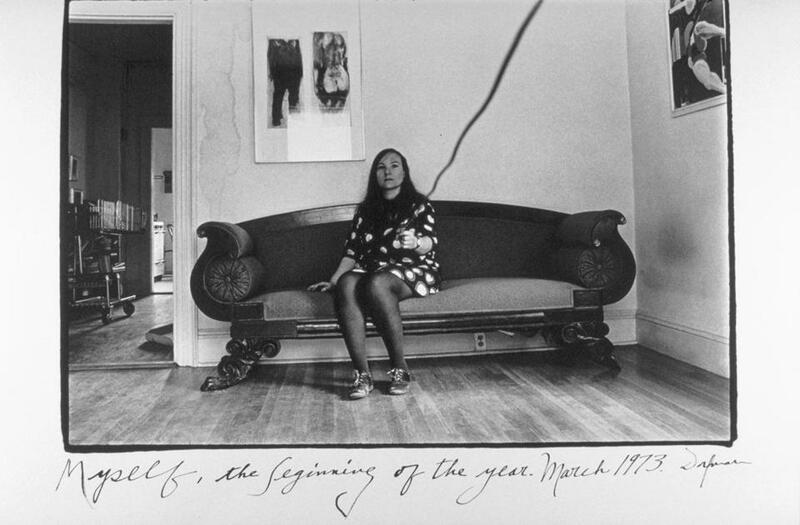 Elsa Dorfman offers a portrait of herself in her Cambridge home, perched on a massive sofa that looks as indestructible as a Maine headland. 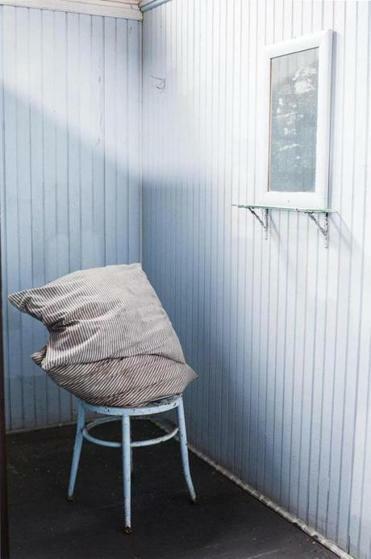 A modest piece that charmed this viewer is called, not without irony, “Main Street.” By Justin Kimball of Florence, Mass., it’s a color photo of the corner of a room where a shapeless bed pillow lies slumped across the top of a metal chair. The stiff-legged chair and shapeless pillow combine to suggest a slovenly human form. You can decide whether you’re looking at an example of bad housekeeping, or witnessing the power of even a weak humanoid presence to occupy and energize an architectural space. At the opposite end in size and drama is a 6-foot-wide oil by Robert Ferrandini called “One Endangered Species Towing Another.” A whale is towing what appears to be the entire downtown of a small city that is floating on a raft. The crowded towers of the city arrange themselves, to this viewer anyway, in the form of a typical still life painting by the Italian master Giorgio Morandi. We’re used to the concept of a ship towing a harpooned whale, but a whale towing a city is a fantasy. Maybe the whale is towing history to the dump? The artist’s title is a tease, telling us what we’re seeing but not why it’s there. But that’s part of the fun of this exhibition. As with the last-page cartoon game of The New Yorker magazine, you may feel here that you’re being asked to supply a caption that will make sense of the art. 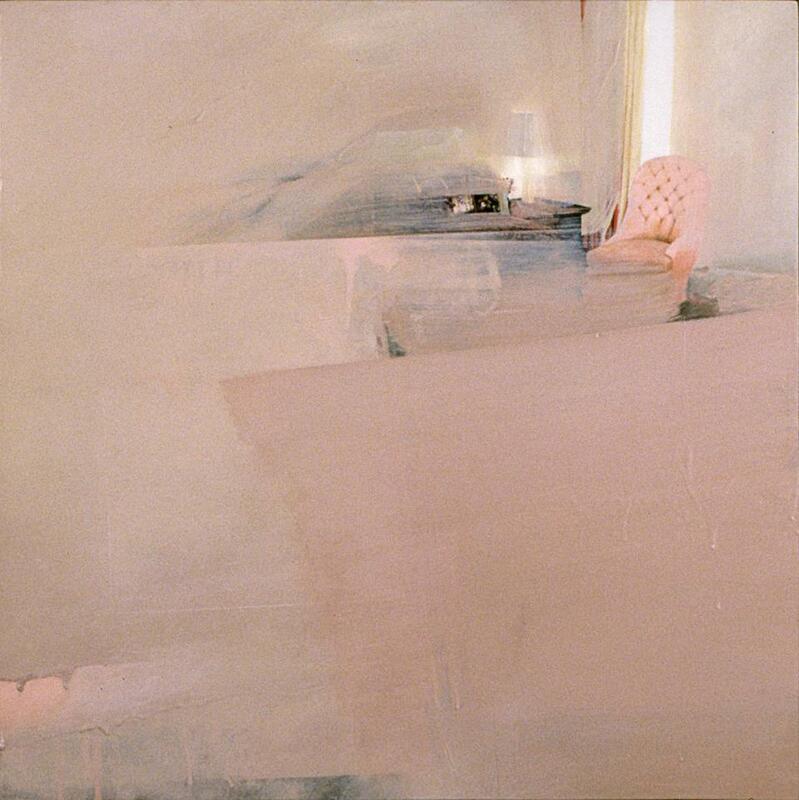 “Lived Space” is on view in the deCordova’s Dewey Family Gallery. Ingeniously, the gallery itself is treated as if it were one of the works in the show. A continuous film strip recounts the history of the deCordova, itself a lived space that has morphed over the years from family summer mansion to ever-evolving art museum. One particularly powerful image depicts the same gallery, crammed with historic art, as it looked around 1910. There’s a lesson in “Lived Space” about the nature of architecture. A painting, say, is complete when it’s complete. You can move it around and hang it on any wall in the world, and it’s still the same painting. A building, by contrast, stays in one place and it has two qualities the painting lacks: It has a context and a purpose. As for its context, it joins a family of buildings and spaces to shape a shared neighborhood (great if the result is the Back Bay, not so good if it’s the Seaport District). As for purpose, a building provides useful space for human habitation — a home, an office, a store, a church, or a glue factory if need be. “Lived Space” reminds us that any work of architecture is part of an insanely rich web of human connections, some of them surprising. A building is never alone. Robert Campbell, the Globe’s architecture critic, can be reached at robert@rcampbell.net.